June is the month of summer in many parts of the world. Whilst kids finish their school term and holiday plans are made, friends and families in the Nordic countries gather to celebrate Midsummer. In Kangasala, my home town in the heart of the lake district in Southern Finland, it looks like the famous midnight sun will be hiding behind thick clouds. Nonetheless, spirits are high as we start tasting the season’s first harvest: fresh potatoes, strawberries and many more delights from the garden. It is this time of the year that my family’s favourite fish, Salmon with Rhubarb. As we get prepared for the barbeque season, my daughter Helena made her very own Healthy Home Made Ketchup to be enjoyed in any quantities kids – and adults alike – around the table want. 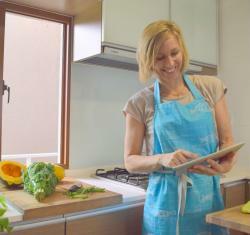 Yourfamily.Kitchen Nutritionist Liza Rowan is also on the road, and shares her best tips for healthy travelling .